Well, it looks like this: He’s been building this story line of grace in my life for a long time. It’s been here all the way through, weaving His theme into my little world. It’s been monogrammed on my heart with the initials that in Hebrew represent the very breath of God. The burning bush whispered the name when Moses brazenly questioned who was sending him, and he had no choice but to remove his sandals upon that holy ground (Exodus 3:14). I’ve been praying for some time now about the title of this blog. And what I initially felt was a theme of the seasons of God’s grace in my life became so apparent as an ongoing narrative as layers of grace unfold. So I asked the question, what would happen if a person actually allowed grace–God’s unmerited, undeserved, holy gift of favor–to write the story of their life? What if it was my name, and I lived like it? Janette, “God’s gracious gift.” Janette is the feminine form of John (my husband’s name), and the name of the disciple they call, “the one whom Jesus loved.” Wasn’t John favored as such that the Son of God loved him like a brother and a friend? Isn’t it at the very essence of grace to say that God became flesh and He became our friend? And greater love has no one than this: that he should lay down his life for his friends (John 15:13). It is not that grace made us a gift, that I should profit from the gift itself and ignore grace, but the gift of grace is that we get to be called “favored one”, His favor-ite–friend of God. For you are a chosen people…God’s very own possession (1 Peter 2:9). 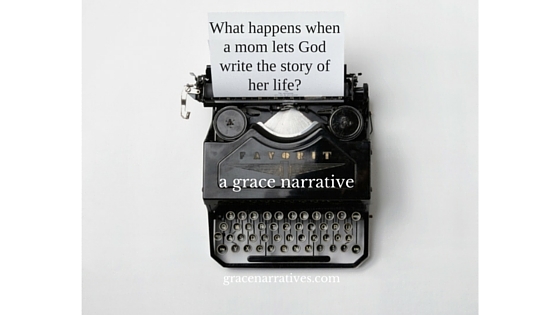 What if…as a wife, a mom, a woman, I let God’s grace write his story on my heart?